In the 2012 preseason poll, the media picked what turned out to be the 7-6 University of Southern California Trojans as the top team in the land. It took three years to recover from being burned by their compulsive love for USC, but like a battered wife who can’t figure out that her prince just isn’t all that royal, the media have forgiven all sins — and this time it will be different. Or so the media think, since they picked USC to be the 2015 Pac-12 football champion. It’s not happening, and why it’s not is the subject of this week’s Three-and-Out. 1. 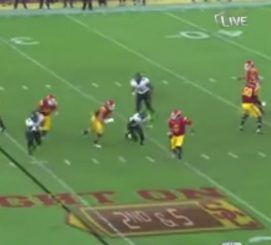 Cody Kessler is not that great of a quarterback. Much of the hype surrounds the return of Kessler, who racked up some pretty impressive stats last year — on the surface, at least. He completed 69.7% of his passes for 3,826 yards, with 39 touchdowns and only 5 interceptions. Kessler — along with the rest of the free world — beat up on Colorado. Unfortunately for USC, Kessler has proven to be at his best when picking on poor defenses, and only mediocre — at best — when playing tough defenses. In just three games against Colorado, Fresno State and Washington State, Kessler racked up 1,113 yards, 16 touchdown passes and no interceptions. In the four games against Arizona, Arizona State, Stanford and UCLA, he totaled 807 yards, with only 2 touchdowns and 2 interceptions. Kessler’s 2014 performance level simply does not reek of “Heisman” despite what the pundits would have us believe. So are we to believe that he will suddenly be that much better in 2015? Maybe because of all the great quarterbacks Steve Sarkisian produced in his five years heading up the Washington program? Uh, no … I didn’t think so. 2. USC lost its best skill players at running back and wide receiver — not to mention on defense. You would have to believe that having a receiver such as Nelson Agholor would help a quarterback’s stats just a bit. Last year, Agholor caught 104 passes for 1,313 yards. Bad, bad news for Trojan fans: Agholor isn’t just gone this year. He’s off to Philadelphia to play for former Oregon coach, Chip Kelly. Nelson Agholor’s production will be hard to replace. But the Trojans didn’t just lose their top receiver. Buck Allen, who caught 41 passes for 458 yards and George Farmer (25 catches for 314 yards) are also off to the NFL. That’s three of the top four receivers gone. If that’s not bad enough, Allen was also by far the team’s leading rusher, with 276 carries for 1,489 yards. Add it all up, and Agholor, Allen and Farmer accounted for 54% of USC’s 3,856 receiving yards and 71% of its 2,092 rushing yards in 2014. While the Trojans — as always — have some great young talent, replacing this level of production is a tall order to ask of green replacements. And even if the Trojans can effectively replace Agholor, Allen and Farmer, they are still nearly 100 yards per game short of what Oregon racked up last year. Kessler and The Replacements will be enough to get the job done on offense only if the Trojans can put together a shut-down defense. But last year’s 46th-ranked scoring defense was only ho-hum, and the Trojans must replace all-American defensive end Leonard Williams and the team’s leading tackler, linebacker Hayes Pullard. 3. Steve Sarkisian talks the talk better than he walks the walk. Sarkisian has been quick to point out that last year’s 9-4 Trojans lost three games by a total of eleven points, and that if they could have won just two of them, they would have been 11-2. This is brilliant math. Let’s hope that Vernon Adams does that well in passing his final math class so that he can join the Ducks. But what Sarkisian doesn’t mention is that the Men of Troy also won four games by a total of 16 points. Pushing those games the other way would have made the Trojans 5-8 — well, actually 5-7, since they wouldn’t have been bowl eligible and wouldn’t have beaten Nebraska 45-42. So, maybe the Trojans were only two field goals away from being 11-2, but they were also only 13 points away from not being bowl eligible. And now they are without their best running back, three of their top four receivers and their top two defensive players from last year. Even starting a new quarterback, Oregon returns far more firepower in the skill positions, as do many of the Pac-12 South powers. 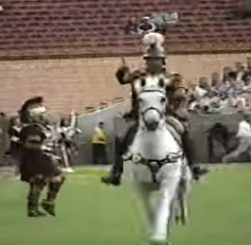 USC tradition (front), empty seats (back). None of this serves to slow what flows from Sarkisian’s mouth. During the Pac-12 Media Days, he took a jab at Oregon by playing the “tradition” card and pointed out that his Trojans wouldn’t be taking the field in 13 different uniforms. 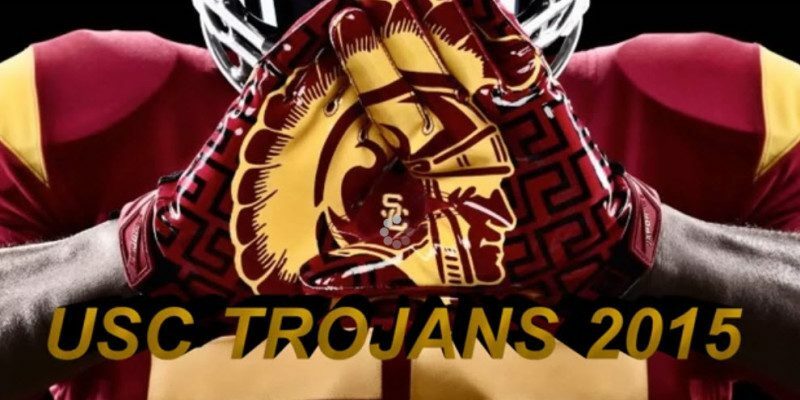 Talk is cheap, but can Sarkisian and the Trojans walk the walk? While at Washington, Sarkisian went 0-5 against Oregon, losing by an average score of 45-19. And Pete Carroll’s era aside, the Trojans are traditional under-performers. But what the heck? USC was almost 11-2 last year and if you don’t think they’re great, just ask them. And here’s one Sark maybe hadn’t thought of — if only an average of two Oregon touchdown passes per game against Washington had been pick sixes the other direction, Sark would be 5-0 against the Ducks. The media is convinced that the 2015 Trojans are the best the Pac-12 has to offer. It all has to do with tradition — which apparently includes not wearing 13 different uniforms. Just one minor detail though — last year, the Ducks didn’t take the field in 13 different uniforms. 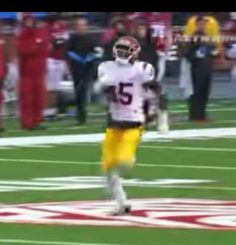 They took the field in 15 different uniforms, and if USC is the biggest thing standing in the way, they will do the same in 2015.